We're less than a week away from Samsung Galaxy Note 5's official unveil and it looks like more information regarding the flagship smartphone's specs has just leaked online. 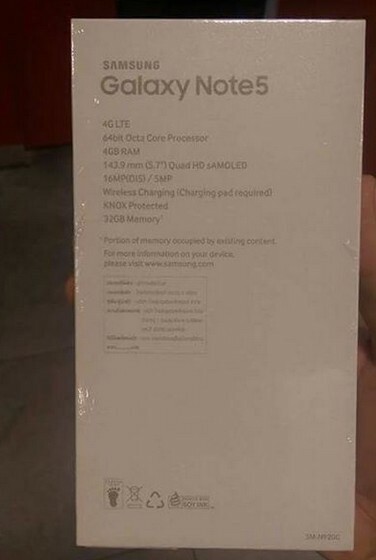 After many renders of the Galaxy Note 5 popped up online, along with info on the phone's hardware coming from sources familiar with Samsung's plans, we now have the first image showing the flagship's sales package. The pictures were published on Facebook, but have been removed shortly after. Luckily, we've been able to save them for your viewing pleasure. Keep in mind though that the actual device isn't shown in these pictures, but the good news is that some of the phone's specs are listed on one side of the sales package. 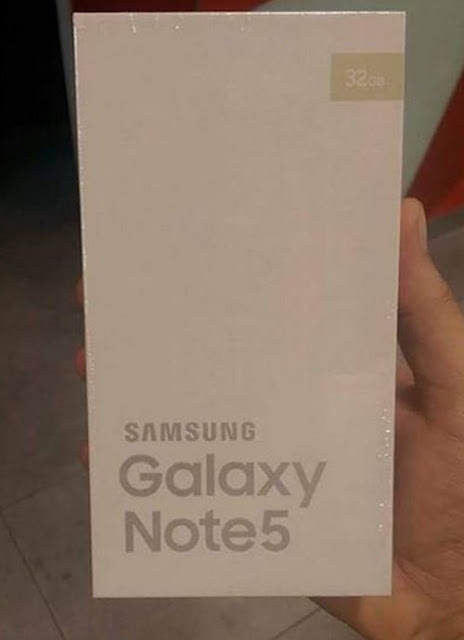 Even though we know quite a lot of info about Samsung Galaxy Note 5's hardware and software configuration, it's nice to have some confirmation on some of the details that leaked not long ago. So, according to these images, one of the Galaxy Note 5 variations that will be available for purchase later this month will pack 32GB of internal memory. There will also be a 64GB model on sale, but it's unclear whether or not Samsung will launch a 128GB version as well, since the similar Galaxy S6 and Galaxy S6 edge models haven't been so popular among customers. The sales package also confirms the smartphone boast a 5.7-inch Super AMOLED capacitive touchscreen display that supports Quad HD (2560 x 1440 pixels) resolution. Also, the flagship handset will come with 4GB of RAM and an impressive 16-megapixel photo snapper on the back, coupled with a 5-megapixel selfie camera in front. Samsung Galaxy Note 5 will ship with Android 5.1.1 Lollipop right out of the box, and it will be powered by a 4,100 mAh battery. One last piece of information mentioned on the sales package is the 64-bit octa-core processor inside the Galaxy Note 5. Although the model is not confirmed, we know the smartphone will be equipped with an Exynos 7420 chipset.